AXE: Slang for musical instrument, probably originated with jazz musicians, especially saxophone players (sax, axe, get it?). Rock musicians started using the term for guitars, even acoustic guitars, in the ‘60s. 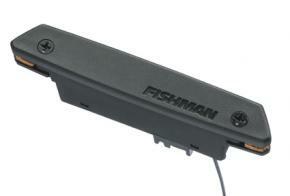 PICKUP: The electrical device on an electric guitar that acts as a transducer. In other words, it converts the vibrational energy of guitar string into electrical impulses. “Pup” is a shorthand term for pickup. COIL: The part of a pickup that has electrical wire wound around a bob-bin to make a coil of wiring. The number of turns of wire affects the output of the pickup. High-output pickups used in heavy rock styles are typically overwound. 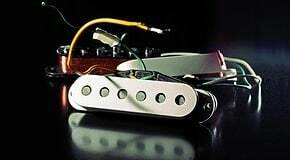 SINGLE-COIL: Single-coil pickups produce a bright, cutting tone rich in higher harmonics. The simplest versions—still found on many guitars and preferred by many players—produce an audible 60-cycle hum when in the presence of certain types of lights, transformers, and other electrical fields. HUMBUCKER: The humbucking pickup has two wound coils next to each other that are wired in reverse polarity. This eliminates or reduces most electrical hum that single-coil pickups are prone to. COIL-SPLITTING: Produces a single-coil tone from a humbucker pickup by routing the electrical signal from only one of a humbucker’s two coils. Sometimes mistakenly referred to as coil-tapping, which takes the output of a pickup from a different location on the pickup’s winding to produce a different tone. AINICO MAGNET: Alloy of aluminum, nickel, and cobalt. Used for magnets in pickups. Alnico 2 produces a sweet, traditional tone, while Alnico 5 (also called Alnico V) is a little stronger and produces a brighter, hotter tone. CERAMIC MAGNET: Used in guitar pickups to produce a hotter output than alnico magnets because ceramic magnets have a stronger magnetic field. FRETBOARD RADIUS: The measure of the curvature of the top of the fretboard from edge to edge is often incorrectly referred to as the “neck radius.” The smaller the radius (e.g. 7-1/2”) means a more curved fretboard that’s more comfortable for making chords. A higher radius such as 10” is flatter which allows extreme string bending without the note “fretting out” that can occur with a smaller (more curved) radius. A compound-radius fingerboard curves more dramatically at the nut for easy chording and flattens out as it approaches the neck joint for low-action bends without fretting out. SCALE LENGTH: The measured distance of the vibrating string length between the nut and the saddle. The 25-1/2” scale length found, for example, on the Fender Stratocaster was taken originally from the standard scale length for steel string acoustic guitars. This scale length provides high tension and thus a more trebly sound. Since it’s slightly more difficult to play guitars of this scale, it is common for guitarists to use lighter strings on 25-1/2”-scale instruments. The shorter 24-3/4” scale on guitars like the Gibson Les Paul promotes easier string bending. TUNE-O-MATIC: Gibson’s name for its adjustable bridge which was introduced in the 1954 Les Paul Custom. The length and height of individual strings can be adjusted for better intonation. Gibson did not patent the name, so other guitar makers now use it. RESONANCE: The relative ability of a guitar body to vibrate when stimulated by guitar strings. More resonance is highly desirable because more resonance equals more tone. Some guitar woods and body styles will resonate more than others. For example, a semi-hollowbody electric guitar with a maple laminate top will have more resonance than a solidbody guitar made from basswood. 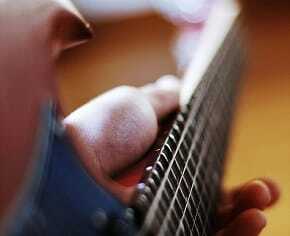 INTONATION: The ability of a guitar to produce notes that are in tune from fret to fret all the way along the neck. Intonation can be adjusted from the string saddles on the bridge. Intonation is also significantly affected by the nut and the type and gauge of strings. NITROCELLULOSE LACQUER FINISH: Sometimes called “nitro” finish—ultrathin, ultralight finish treatment that creates the patina of a gently aged vintage guitar. The process is more expensive because it takes weeks to apply. A thin nitrocellulose finish allows the wood to breathe and gets thinner over time. Many feel the thin nitrocellulose lacquer finish enhances tone. POLYURETHANE FINISH (OR URETHANE/POLYESTER): A modern guitar finish that’s durable and takes less time to apply resulting in a lower cost. LONG-NECK TENON: Also called long tenon or deep tenon—part of the neck that extends into the body for a more solid join when neck and body are glued together. CHAMBERED: Guitar body with carefully selected cavities, or dynamic sound chambers routed into the body. Not to be confused with “weight relief” holes which are drilled. DIE-CAST TUNERS: Machine heads formed individually as opposed to exposed gears fixed on a plate that houses a row of gears, or a stamped housing. VIBRATO/TREMOLO: The two terms are used interchangeably when referring to a guitar bridge that allows the guitarist to move the pitch of the strings down and up. Vibrato is a musical term referring to a player oscillating the pitch of the note being played (or sung); this controlled wavering is a means of creating individual expression. Tremolo is another name for vibrato tailpiece. In guitar talk, tremolo more correctly refers to the effect where volume continually increases and decreases at a set rate. Whammy-bar is a slang term for vibrato tailpiece. Vibrato tailpiece design that locks down the guitar string both at the bridge and at the nut. This prevents the active string length from changing and keeps the guitar in tune no matter how vigorously the whammy bar is used. One tradeoff with a double-locking trem system is that it takes a little longer to change strings.